Central City Library is hoping to redefine the way we think about library spaces, services and communities with the establishment of its very own Makerspace. A 3D-printed Yoda figure atop a robotic car. The term “makerspace” is tricky to define – a makerspace can be a workshop, a technology suite or simply a meeting area. It often contains tools of some type, but these can include anything from knitting needles or bandsaws to 3D printers. Others constitute simply a space in which to meet and collaborate. When the establishment of a makerspace was suggested at Central City Library in 2013, the widespread response was “What’s that?” Even tech-savvy librarians Hamish Lindop, Penny Dugmore and Baruk Jacob, who were asked to spearhead the project, admit they had no idea what they had been tasked with. On the list of community groups to talk to and engage with were members of the Tangleball “hackerspace” collective, technology agency Mindhive, mobile app developer App la carte, digital education specialist Mindlab and Vivenda, a 3D printing business. After several weeks of emails, phone calls, head-scratching and spit-balling, a vision for the Central City Makerspace started to materialise and the team decided they wanted this makerspace to be digital. The Central City Library 3D printer. “A lot of overseas makerspaces have 3D printers and they’ve become emblematic of the concept of Making,” says Hamish. “The connection between the digital and the physical is what hooks people in. So we decided that was what we wanted to do as well." However, the emphasis on digital technology was less about gadgets and more about offering an opportunity: to build communities and conceptualise libraries as places of creation. The next task was to find a home for the makerspace. With floor space short in supply at the busy Central City library, the only option was an office behind the Citizens Advice Bureau on level 1. Accessibility and visibility became issues early on. The makerspace was initially launched with a series of “hangouts” and workshops with local experts such as Rohan from App la Carte and members of the 3D Hobby Club. Hamish and Penny thought they knew who they’d see walking through the doors at these events – tech-heads and digitally savvy customers. But they were surprised. “The people who were coming weren’t what we expected,” says Penny. They weren’t your traditional technology enthusiasts - although those customers were coming too - but the core of Makerspace visitors have been parents or grandparents with children. small brush and simple circuitry. The team’s initial assumption that external experts would run the workshops while they took a backseat role soon proved to be impractical, and Penny and Hamish found they ended up delivering sessions themselves. Penny hosted a phenomenally successful “brushbots” workshop, where kids and adults worked alongside one another to build small robots out of brushes and some simple circuitry. Hamish spent a day facilitating a game-making jam, initially planned as a two-hour session, but which morphed into a marathon collaborative workshop with 10 boys building scores of simple platform computer games. See the games they created in our virtual arcade on Pinterest. “These boys were flat-out making games for four or five hours, and during that time they were all problem-solving and knowledge-sharing together. “The powerful thing about the makerspace is that it provides an opportunity for knowledge sharing between people who would never otherwise meet,” says Hamish. The Central City makerspace was initially suggested as a pilot project but its success has seen the idea take hold as a key future direction for Auckland Libraries. More spaces are being planned across the region but each has its own unique focus - Glen Eden aims to focus on robotics, while Te Matariki Clendon, Panmure and Mangere East are planning makerspaces focused on music and sound recording. Meanwhile, the Central City Library makerspace is moving out of its cramped office onto the main floor of the library on Level 1. It’s hoped that this move will make it easier for customers to discover the space, while also potentially changing the way it is used. The 3D printer will remain a focus but it’s hoped that it will serve more as a resource – just as anyone might visit their library to use the photocopier, log on to the free wifi or attend an event, the 3D printer will also be available for anyone to print out a prototype or experiment with open-source software. But its role extends beyond the present and into the future. “We’ve started seeing makerspace activities pop up at other libraries and locations – stuff we’re doing has infected individuals, as well as libraries,” says Penny. “Visitors have come from around the country and taken what they’ve learned back to their home towns. Central City makerspace has now moved out onto the main library floor to raise the profile of the space and offer users more room to make and create. Auckland's newest makerspace can be found at Panmure Library, where computers running Linux software allow people of all ages to record music, make beats, edit photos and use other digital tools for free. 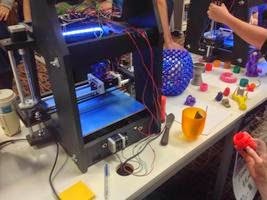 The team behind Auckland Libraries' first makerspace at Central City Library have been nominated for a New Zealand Open Source Award.